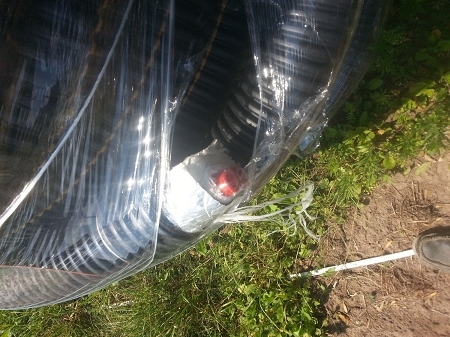 This is the exact same as our regular 5 wrap pipe but the pex has O2 barrier pex inside. 1. Our Rheau R18 pex and microfoil closed cell insulation is wrapped so it separates the 2 Rehau pex tubes. This eliminates heat transfer from one line to the other. 2. Our microfoil closed cell insulation is much better than the 3 and 5 wrap others use. We could save 40 cents per foot using the competitions cheaper insulation but we feel that the insulation is the most important part of the product and refuse to forgo quality for price. 3.We use Rehau class (A) pex tubing. Class (A) pex pipe is the most expensive and best pex that you can buy. Rheau pex is expandable other pex pipe is not expandable. This means if the pex freezes under the ground or above then it will not crack or split. Others say the pex they sell is not expandable but will not crack if frozen!!! !.I have never seen water freeze and not expand . 4. The drain tile we use is made just for this type of product. It is made thicker and slower to help eliminate BLOWOUTS in the drain tile therefore helping to eliminating problems for customers. 5. Folks we do not put an electrical wire inside of our pipe. Think about it??? If the electrical line did fail it would electrify the house and could cause fire or possible injury. The electrical line inside the pipe is not code and would not be safe to install that way. 6. Others say they are a USA mfg BEWARE as they may buy foreign then assemble them here. We use Rehau pex pipe made in the USA. We use drain tile made in the USA We use Microfoil insulation made in the USA. We put all the parts together in the USA. NOW IT DOES NOT GET ANY MORE USA MADE THAN THAT. Our superior American Royal 02 barrier pipe consist of two class A (Rehau or Wirsbo) 1 inch pex tubes wrapped in our premium quad wrap insulation that is then pre-assembeled in our protective 4 inch waterproof drain tile. The two pex lines are coded for ease in telling the difference between the two. What is the difference between our pipe and the pipe others are selling? Our pipe insulation is made from our high quality microfoil invented by NASA, not the cheaper bubble wrap or low E insulation that others use. Our high quality insulated line has a much higher R value than others with a rating of about R18. That is about 1 degrees of heat loss per 150ft of tubing. That makes this one of the best values. Ours does NOT have a string in it to pull the electric wire through. Water and electric does NOT mix! By putting your electrical wire through the same tubing as the water lines, you are endangering yourself in case of a short in the wire as it will electrify your water in the line. This can cause a fire or even death! Our line is expandable! Others may tell you that the pipe they sell is not expandable and will not crack if frozen. Have you ever seen water freeze and not expand? Decide for yourself if the wool is being pulled over your eyes! Beware of cheaper grades of pipe! Our heavy duty tubing has the shipping weight of 300lbs per 250 foot roll. The inside pipe of this product is class A pex for portable water. Many towns and building inspectors will not approve anything but Class A for underground applications! If you are looking at pipe that is not expandable and can only be used with crimp fittings, or that does not have Class A printed on the pipe, it's more than likely NOT pex Class (A) for potable water and a cheaper quality! The 1 inch Pex lines are made from REHAU Pex or WIRSBO, two of the top quality lines on the market! Our customers do NOT have a choice of the brand it depends of availability between these two lines but both are equally superior. Introducing our LIFETIME limited warranty against cracking and splitting. We can offer this amazing warranty to you because of the high quality of this pipe! Shop with confidence! If the inside pipe freezes and cracks, we will replace it at no charge to you! If the line freezes and cracks due to pump failure or other reasons, we will ship you a 'loaner line' that can be laid on top of the ground until the spring when the frozen lines thaw out. There is no charge for this service except for the shipping costs to and from your location, as this is will be only a loaner line and must be returned. No other company makes this offer! Our pipe can freeze solid without breaking where others can not! We offer service over the phone even after the sale! 7 days a week! Contact our knowledgeable staff for any questions or concerns. We would be delighted to answer any questions you may have! Don't delay we have this product in stock for immediate shipment. We will ship to a business from the Dakota's and East for $169 but it must be to a commercial business address with no residence on the property. Because the driver just shows up for a commercial delivery, the business has to be open normal business hours and someone there to unload with a fork lift or loading dock. Please include this information at the time of purchase or email the information to us immediately to insure your shipment will not be delayed due to not providing the correct shipping information. Residential delivery is available for an additional cost of about $60. You are responsible for unloading the package but it does includes a phone call before delivery so you know when the truck will arrive. If a lift gate is required for your residential shipment, it can be arranged so please contact us for a quote. International commercial and residential shipments are available as well, please contact us for a quote. We just want to take the time to thank your for the opportunity to service you and your project! We enjoy answering questions and helping your project run a little smoother! Do not hesitate to contact us with any questions or concerns!